Here’s what shooting your heist picture in a single take gives you — breathless tension. The title character, played with a tri-lingual, makeup-free verve by Laia Costa, lives in Berlin. She’s Spanish, loves the club life and dancing. She flirts with a guy — four guys. And from the looks of them, we know she’s in for a rough night. You can tell they’re violent, that their boundaries should scare her off. Sonne (Frederick Lau) is a hothead and knows a bit about guns. Boxer, (Franz Rogowski), Blinker (Burak Yigit), and Fuss (Max Mauff) are just as scary, just as out of control. But Victoria doesn’t flinch. She is drawn to Sonne, and the movie captures their romantic do-se-do in a party. Then a phone call reminds Sonne of a c0mmitment, a heist they’re to pull. And Victoria is pulled into the vortex of violence that comes from that. There’s not a lot of plot, not any excess dialogue, just a lot of pre-arranged destinations (22 locations) and a camera chasing them as they do the robbery, hit a club afterwards, and then it all goes wrong. Director of Photography Sturla Brandth Grovlen’s camera keeps the images tight and in-focus when the characters close in on him, shaking and jolting us as they sprint away from one trouble and into another. 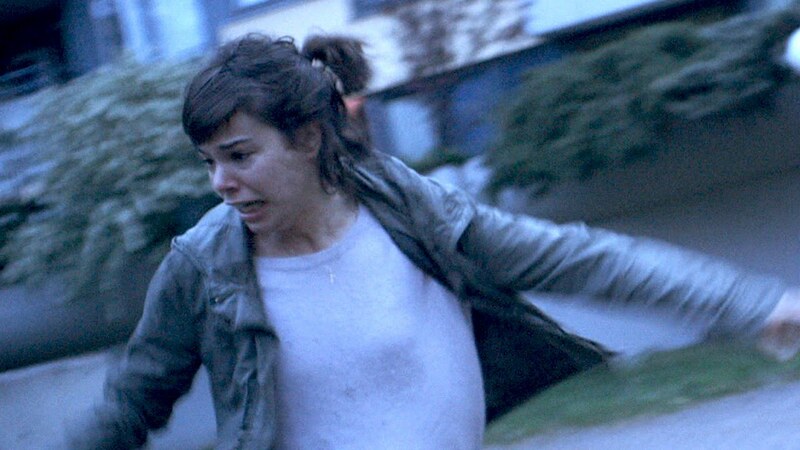 “Victoria” is one “shaky-cam” movie almost guaranteed to give you a headache, simply because of the effort your eyes make in keeping everybody steady in the frame inside of your head. Co-writer/director Sebastian Schipper does a terrific job of maintaining a point of view as he rolls Berlin over to show its drab, grey underbelly. Several scenes rattle the quintet, and rattle us as they battle cops and try to make their getaway with the cash. The fatalism of Teutonic youth, a hallmark of the German cinema of the Cold War, here takes on a self-destructive tint. There’s desperation, in one and all, a “Breahless/Bonnie & Clyde” need to break free from convention and boredom, an instant connection and sense of “code” that emerges in the film’s 138 minutes. Yes, it’s a stunt, a gimmick, and 138 minutes of it is entirely too much. Long-take cinema is inherently “uncinematic,” as many of those who tried it (Hitchcock) noted. Editing adds tension, even more than going over two hours without a cut can manage. But “Victoria” shows us just how real things can get in this tiny-camera/infinite filming (video) capacity era. Plan and rehearse, limit the geography of your shoot to an area whose boundaries are a short taxi ride or long sprint apart. And by all means, make sure your cameraman is up for running a marathon. It’s not just the actors and the viewer who will be out of breath when it’s all over. Credits: Directed by Sebastian Schipper , script by Olivia Neergaar-Holm, Eike Frederik Schulz Sebastian Schipper. A release.